PRESS RELEASE: Sonor is proud to announce the launch of its latest Special Edition Drum set, Beech Infinite. In a complex lacquering process, all of the Beech Infinite shells are finished with a special 'SoftTouch' paint by hand. The result is a unique, velvet-like shell surface. Available SoftTouch finishes are Crème Lacquer and Black. A Beech Infinite design badge adds to the exclusive personality. The Shell kit comes with a 22"x20" bass drum (no mount) for uncompromisingly fat sounds, a 14"x6" snare drum and shallow sized tom toms in 10"x7" and 12"x8" and floor toms in 14"x12" and 16"x14" that enhances definition and attack. 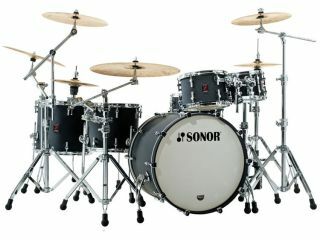 All shells are made out of selected premium German Beech wood and handcrafted with Sonor's very own CLTF "Cross Laminated Tension Free" process. Beech delivers a full and saturated Sound with well-balanced low, mid and high tones. All lugs are equipped with TuneSafe for maximum tuning stability.